Advaita Acarya knew that Jagannatha Misra and Mother Sachi Devi were going to be the parents of the next incarnation of Krishna before Lord Caitanya was born? Advaita Acharya (also known as Kamalaksha) appeared long before Sri Caitanya Mahaprabhu. He was born in 1434 in Navagram, Bengal, and disappeared in the year 1559, at the age of 125 years. He was the incarnation of Maha-Vishnu and Sadashiva combined. Before the appearance of Sri Gauranga Mahaprabhu, all the Vaishnava Devotees in the Navadvipa area used to gather at the house of the Acarya. In these meetings, he preached on the basis of the Bhagavad Gita and Srimad Bhagavatam. Even Visvarupa, Mahaprabhu’s elder brother would go listen to the Acarya. 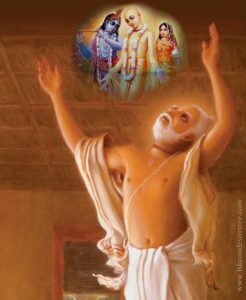 But he felt very sad seeing the growing materialism simmering around Him and decided that only the Supreme Personality of Godhead could save the world. Therefore He worshiped His Salagrama Sila with sacred Tulasi leaves and Ganges water for a long time, calling outloud the Lord to appear. However He didn’t know how, when and where the Lord would appear. Ever Nimai’s birth, when the Acarya and His wife Sita Thakurani went to visit Jagannatha Misra, He could not recognize the Lord. This very well fulfil the definition of Mahaprabhu and the Channavatara, the hidden incarnation and it was the work of Yogamaya, as Advaita Acarya had all qualifications to recognize the Supreme Personality of Godhead.